Eurocopter Deutschland used registration D-HECG for the 1999-built Eurocopter EC135 T1 c/n 0115. In January 2000, the VIP-aircraft was registered VP-CAF with Mr. Al Fayed, the Chairman of Harrods. On 25 April 2001, the helicopter was registered G-HARP in the UK with Air Harrods. Registration G-HARP was cancelled on 29 November 2002 and the EC135 T1 was registered P4-LGB at Aruba with Roman Abramovich. LGB stands for “Le Grand Blue” the name of the private yacht of the owner on which it was boarded. On 17 May 2004, the aircraft was re-registered P4-XTC with Horizon Investments AVV as registered owner and on 4 July 2004, the P4-XTC was registered with Beautiful Heli. The P4-XTC was boarded at the “Ecstasea”, one of the owner’s (Roman Abramovich) private yachts. On 13 March 2008, the EC135 T1 returned in the UK-register as G-CEYF with Starspeed Ltd., Blackbushe Airport. On 4 October 2013, registered ownership of EC135 T1 G-CEYF changed to Lynx-Heli Ltd., Jersey. On 28 March 2014, registration G-CEYF was cancelled as exported to Isle of Man and was registered M-GLBL with Lynx-Heli Ltd., Jersey, the same day. On 19 May 2015, the EC135 T1 was registered G-NSYS in the UK with Nova Aerospace, Costwold Airport. 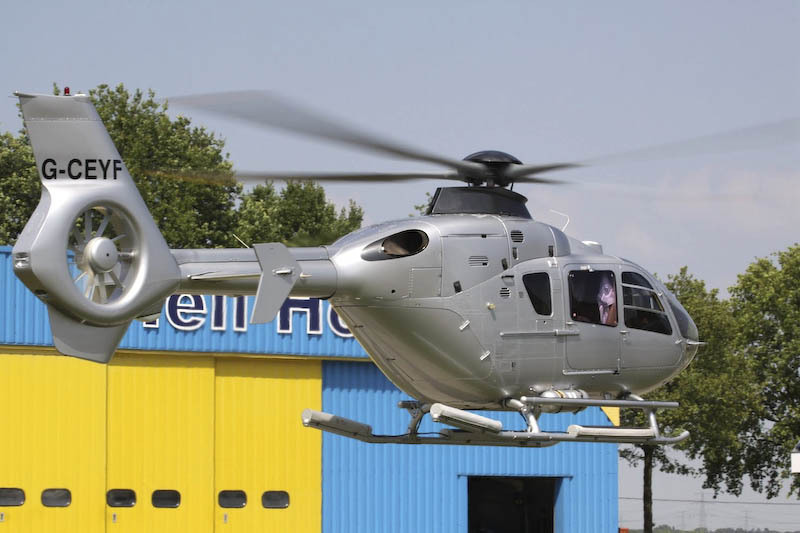 On 14 July 2010, the with emergency floats equipped EC135 T1 G-CEYF landed at the Heli Holland heliport near Emmen in the Netherlands during a flight to Sweden.